We’re committed to raising winning cutting horses and producing excellent quality alfalfa and grass hay. We have developed outstanding systems to ensure excellence in every aspect of Coyote Rock Ranch. Whether it’s a bale of hay or a future-champion foal, we want it to be the very best. Choose an area to learn more about the quality that defines the Coyote Rock Ranch Advantage. Nestled in the heart of Oregon’s high desert country, Coyote Rock Ranch is surrounded by stunning mountain vistas, spectacular rock formations, and green pastures where horses can roam, graze, and thrive. We build our own barns, fences and structures, focusing on quality, function, and an attractive appearance to welcome ranch visitors. Our handcrafted barns, winding red rock roads and meticulously maintained farmlands highlight the commitment to craftsmanship and detail that are the hallmarks of Coyote Rock Ranch. At Coyote Rock Ranch, we grow top quality alfalfa and grass hay on 320 acres of irrigated farmland in Central Oregon. In support of the ranch operation, we sell horse, beef, and dairy quality alfalfa and grass hay that meets or exceeds nutritional standards. We carefully control every aspect of farming and production, bringing our horses – and our customers – the highest quality results. By growing our own hay and carefully monitoring and testing nutritional content, we are able to raise healthier, higher quality performance horses. About 120 acres of our farmland is devoted to grass hay production. From selecting the seed, to farming the land, irrigating it with our efficient irrigation system, to testing and controlling the nutritional value of each crop yield, Coyote Rock Ranch controls every aspect of our hay production, and therefore, our horses’ nutrition. We handpicked our broodmares to ensure proven pedigrees and performance records and crossed them with top-of-the-industry sires to produce exceptional prospects. Our unique breeding philosophy focuses on quality over quantity. 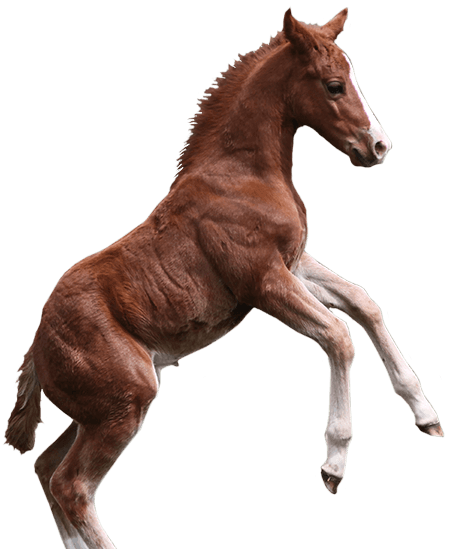 By breeding a small number of quality broodmares, we can focus more closely on the individual care and training of each horse, with the goal of giving every foal the best possible opportunity to become a winner. Every foal is different. We hand-select trainers for each prospect, choosing the trainer we believe will be the best match to guide each horse’s individual development. While they are in training, we check in with each horse regularly, frequently visiting them on-site to assess and discuss how training is progressing and to set and/or review measurable goals for each individual. Coyote Rock Ranch is hiring! Please see our current job opportunities below. Email Sue Hagerty at sue@coyoterockranch.com with your resume and cover letter.